Parasite, shriveled and sporting a beanie, a raincoat and jeans stands atop a building looking down at the citizens below. He feels hungry and moans in monologue. Spotting some people in his line of sight he jumps off the building vowing never to be hungry again. Back three weeks and we meet Joshua Michael Allen, a scrawny bike messenger with bright pink hair, piercings and a massive chip on his shoulder over just about anything. He is, for want of better phrasing, a total douchebag. One day dashing through the streets where pesky drivers and pedestrians block his path Joshua smashes through the crowds and is his usual foul self until a car flies through the air and knocks him over. Clambering up the next thing he sees is a giant booger monster as it attacks the city. The living heap of goo's attack makes Josh's level of hate shoot through the roof and he smashes his bike into the sludge. The snot grabs Josh and hurls him near some fallen power lines. Figuring he was going to die, Josh grabs a line and electrocutes the creature before falling unconscious. When he awakens he has a broken leg. His boss, no doubt fueled by his poor service record fires him. Next his girlfriend finds out he can't pay her back for loans and brands him a parasite before leaving for good. Having lost none of his charm Josh wallows in his bad attitude until S.T.A.R Labs contacts him offering money if he comes in for some tests after his contact with the creature. The scientists remove his piercings and attach E.K.G patches and lay him down in a strange medical scanner. Medical readings become erratic and electrical bulbs in the lab blow, drained of energy. When Josh climbs out of the scanner he has accidentally drained all the scientists and is now sporting purple skin and a mouth like a leech. He finds he now has an insatiable hunger. He goes about murdering his ex and feeding on innocent people, trying to hide in plain sight, none of which fulfills him until he finds himself at the top of a building (where the story began) leaping towards more 'food'. Superman, however, intervenes in what appears a suicide but the instant the Man of Steel's skin makes contact, Josh becomes a swollen lump of flesh. Draining him more and more, Josh becomes bigger and bigger. Superman uses heat vision to blast his attacker away and give him breathing space. Josh discovers he can mimic his 'food' abilities and rushes forwards expending his own heat vision. Using this power depletes his mass and power levels until Josh is back to being scrawny. Superman uses his arctic breath to freeze his attacker before he can feed again and puts him in Belle Reve for his crimes. Story - 1: This was awful. The only plus point was that a bit of effort was put in to tie it to continuity of a current story in the sister title Action Comics. This character, unlike Rudy Jones, is just one dimensional. Even when he attacks the monster, neither he nor the writer knows why. He is unlikeable and thus makes him a version of the parasite with no point of character except to eat. Maybe if they looked into Parasite's past adaptions they'd see there was more to the character, more potential and even a side to like that is completely sidestepped here. We got an issue of him whining a lot, and when he came up against Superman, frankly his fight was pathetic. Even the misstep by Geoff Johns and the radioactive donut was a better adaption, the snot monster link ties him closer to Superman but frankly this new version needs a lot of work. 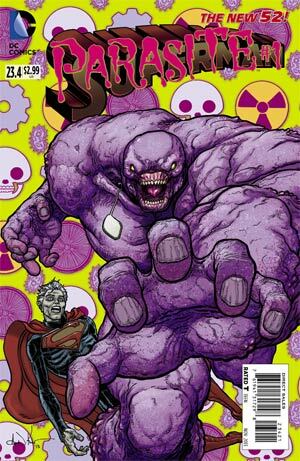 I wish I had more positive things to say about Aaron Kuder's debut issue but I can't find anything. Art - 3: If you're a fan of Frank Quitely's style this will be right up your alley. Somehow the busy lettering and cartoonish moments pull me away from what I think is meant to be a dark and broody tale. Cover Art - 2: In Superman: The Animated Series, I think they got the character and design spot on, I am not a fan of a blubbery Parasite and that wallpaper in the background? Yuck.